Laika, the first dog in space, was never killed. Instead her trajectory put her into deep space. After travelling for eons, she was discovered and picked up by an advanced alien race. Artifically enhanced and after 70,000 years in outer space, Laika returns to Earth to wreak havoc among her human suppressors … or what remains of them. 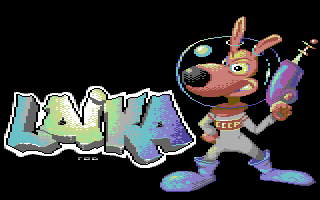 Image uses C64 mcol restrictions. This entry was posted on Thursday, June 13th, 2013 at 9:06	and is filed under Art. You can follow any responses to this entry through the RSS 2.0 feed. You can leave a response, or trackback from your own site.